From the Peter Rhodes column in the Express & Star, Thursday 4th March 2011. 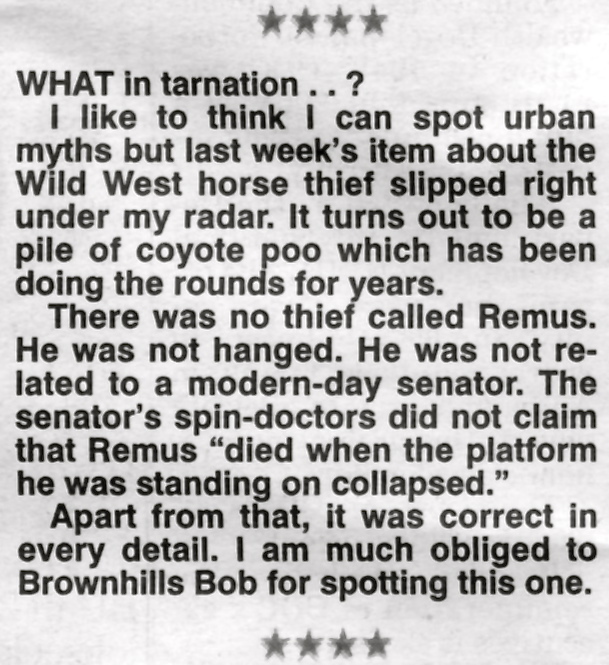 I was amused to note tonight that after my ribbing here a few days ago, Peter Rhodes, columnist in the Express & Star, was man enough to acknowledge his vectoring of the hanged outlaw myth. It takes balls to do that publicly, and I salute Peter for his honesty, and thank him for his acknowledgment. This entry was posted in Events, Express & Star, Followups, Just plain daft, Local Blogs, Local media, Shared media, Social Media, Spotted whilst browsing the web and tagged columists, crap journalism, Express & Star, horse theif myth, Hung Ancestor, Peter Rhodes, Remus Rodham Debunked, Silly, Snopes, Truthorfiction, Urban Myths, Walsall. Bookmark the permalink.